The general process of installing memory modules, or RAM, in a laptop is very similar from one brand to another; today, nearly every laptop design places an access panel on the bottom of the laptop and uses similarly latching sockets. The description used here is for the Toshiba Satellite P205 laptop. Why remove the AC adapter and the battery before installing memory modules? First of all, plugging them in while power is on could result in damage to the RAM. Secondly, doing any work on a laptop while power is applied could result in a damaging spark. Carefully remove a new memory module from its packaging. Avoid touching the connectors; doing so can reduce conductivity because of oils on your finger. Locate an empty module slot. If two sockets are in the compartment and the top one is filled and the bottom is empty, remove the top module first. 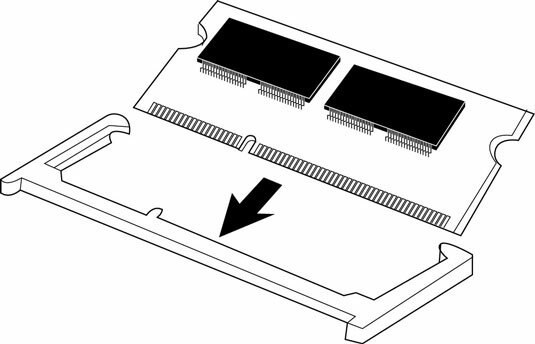 Pick up the memory module by its sides and aim its connectors toward the socket. Be sure to align the notch in the connector with the matching key in the socket. See the figure below. Slide the module into place. 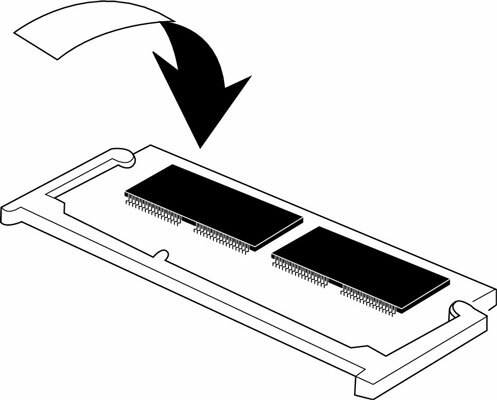 Align the notch in the connector of the memory module with the corresponding key in the socket. Most sockets align at about a 30-degree angle. Once the module is fully inserted into the socket, press down on the top edge of the device to latch it into place. This way it’s flat to the laptop’s bottom. The carrier should snap into place with latches. See the following figure. 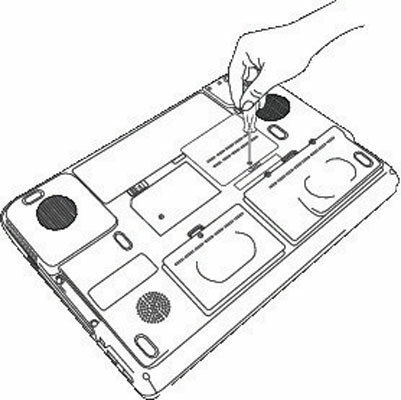 Gently push the module, in its carrier, back to a flat position on the bottom of the laptop. It should gently latch into place. Don’t over tighten the screw.